May be used horizontally for special pressing applications with user-supplied supports. 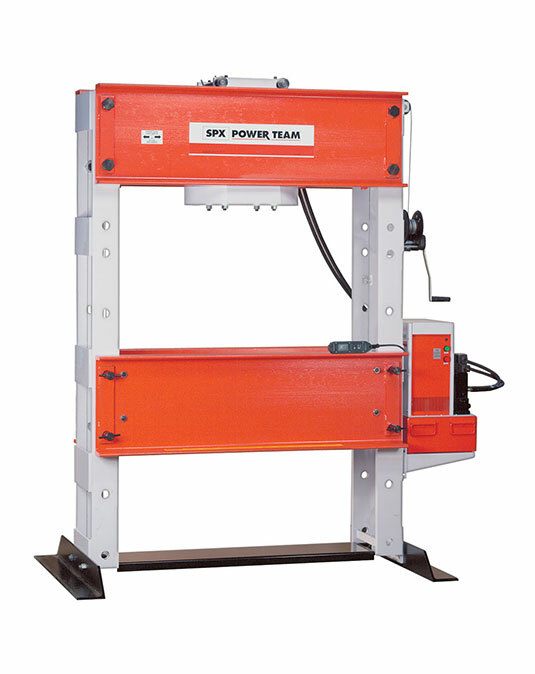 Work-head has wide horizontal travel; rugged press frame withstands load of rated capacity across full width of frame. Winch mechanism provides easy positioning of press bed, locks in place for insertion of retaining pins. Upper bolster can be lowered 11″ for convenient positioning on repetitive jobs. Fast cylinder approach is provided by PQ1204S ‘Quiet’ electric/hydraulic pump. Has remote control hand switch, enabling operator to view work from all sides with fingertip control of cylinder piston travel.